A new report from Yesmail reveals that the volume of email sent and received is growing but open rates are declining. Don't worry, there's a good reason. The number of emails arriving in subscribers' inboxes, according to Yesmail's study, increased by 9 percent between 2Q13 and 2Q14, while the overall email open rate declined 3% during the same period, most likely because of the added volume of messages. The good news, however is that the number of opens for each active subscriber increased 6 percent year-over-year. Essentially, even though recipients are getting more email, the more engaged members of an audience are opening more emails than ever before. 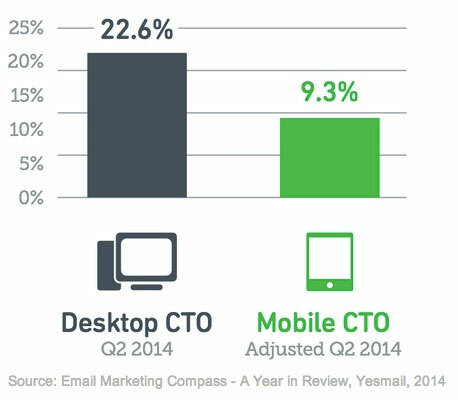 - Email opens on mobile devices accounted for 64.5% of opens in 2Q14, compared with just 35.5% on desktops. - Mobile devices accounted for just 35% of all email clicks—a 9% increase YOY but still much less than the overall share of opens. - The average mobile click-to-open rate increased YOY (reaching 9.3% in 2Q14) but still lags the desktop average click-to-open rate of 22.6%. - Mobile transactions accounted for 22% of all purchases driven by email in 2Q14, a 40% YOY increase. - Although the the number of mobile orders jumped year-over-year, the revenue associated with these purchases only increased by 10%. - Triggered messages—such as abandoned shopping cart and welcome emails—had a 2.5x higher average open rate in 2Q14 compared with general campaigns (38.9% vs. 15.1%). Triggered messages also had a 2x higher average unique click rate compared with general campaigns (3.4% vs. 1.7%).